The new academic session kick-started with maven minds getting together, sharing a mutual vision and objective. 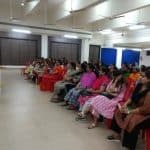 At the outset, our Principal Mrs. Jyoti Kumar welcomed all the teachers and motivated them to give their best for a yet another promising year. She declared the recipients of the coveted ‘Creative Teacher Award’ and appreciated the qualities of each one of them. The ‘Quality Enhancement Time’ started with a session on LEADERSHIP: Rising to challenge…With a Mission…. 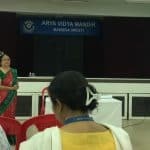 anything is possible, it was conducted by Ms Rupali Kaushal for all the teachers at AVMBW. 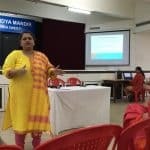 Ms Rupali reinforced the value of Leadership with a power point presentation and gave workable examples and practices to the teachers to enhance and recognize their leadership abilities. 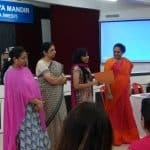 Ms Rupali enlightened all with the characteristics of good leaders such as they never hesitate to empower, they upgrade their skills and exchange ideas freely. She also shared the various attributes of good leadership such as having a sharp and clear vision. A good leader should take cognizance of what’s happening in and around the school and ensure that there is a production belt right from the bottom to the top. They are good listeners and in control of their emotions at all times. Ms Rupali also shared that a good leader is a ‘Design Thinker’ and is a person who thinks of new ideas beyond oneself. They are able to set the tone for the right culture. The teachers were informed that some good institutions also may have some bad habits such as they feel that they are large, they have arrived and are not willing to change with the times. Ms Rupali also enlightened the audience about how a good leader allocates, balances, separates resources and does not redirect them. They use different criteria to evaluate and experiment all the time to ensure that the resource allocation is worthwhile. Ms Rupali shared that a leader gets people in sync with the schools vision and takes stock of the culture each one has to adopt in the school. She shared the culture of various schools and the implications it has on the staff members. Ms Rupali discussed that an Institution with High Support and High challenges is an institution of ‘Ethical Leadership’ wherein every staff member is committed and feedback is given to the staff members whether positive or negative. In such an institution there is a high level of confidence towards the leaders. • Where you want to be? • How you’re going to get there? Gap Analysis enables you to quantify the gap. An activity was conducted wherein the teachers were guided to identify a topic on self-improvisation and improvisation of the school system and conduct a Gap Analysis on the same. The session ended with a congratulatory message as the session was well received by all. The second session for the day was ‘Computational Thinking Skills’ conducted by Ms. Asha Acharya. She spoke of the core components of Computational Thinking Skills: Decomposition, Pattern recognition, Abstraction and Algorithms. She also threw light on an important topic ‘Python language’ which is quickly becoming a necessary foundational skill for students. The session consisted of activities and plenty of coding examples. Teachers enjoyed the activities as well as the hands-on-experience on coding in ‘Python’. Children are not afraid to take risks, by utilizing the natural inclinations of young minds to explore and play, and by encouraging problem solving skills, we can give their thoughts a structure as it allows students to be active, rather than passive users of technology.